Over the winter transfer window, mid-table Dutch club Heracles Almelo were handed a major victory when Brandley Kuwas decided to remain at the club. The 25-year-old winger was linked with the likes of Leeds United but will play out the remainder of the season with Heracles. Kuwas is the Eredivisie’s leading assist man, with 11 at the time of writing. He’s been a dynamic force in John Stegeman’s attack for nearly two seasons and the Dutchman is finally earning himself a big move with his fantastic form. It’s clear to see why the larger Dutch clubs, along with some foreign teams, are tracking Brandley Kuwas closely. Not only are Heracles in a position where they must sell the attacker for any good fee, but Kuwas’ abilities are translatable to a higher level of football. Brandley has already eclipsed his goal & assist totals from last season and has made himself crucial to Heracles’ success. Kuwas has been playing with a certain level of arrogance recently – the type of flashy confidence you see from the likes of Neymar, Paulo Dybala, or even his compatriot Memphis Depay. He’s the boss of the Almelo club with the stats to back it up – 4 goals, 11 assists, and a stunning 4.1 successful dribbles per 90 (WhoScored). His assist and dribble totals are the best in the division. At this point, there’s no denying Kuwas’ talents. With that said, let’s take a deep dive into his play style, with a focus on his strengths and weaknesses. Brandley Kuwas is a burly right-winger. Much like his fellow Eredivisie star David Neres, Kuwas is left-footed. This makes him the prototype inverted-winger, often opting to cut inside to create space. However, there is much more to Kuwas’ skill set than the classic Arjen Robben cut-in. Kuwas is extremely adept at 1-on-1 dribbling challenges, exploiting the relative lack of defensive ability in the Eredivisie. Whether it’s out on the right flank, right half-space, or left side of the pitch, his first thought is always to take on his marker. Heracles set up to allow this by creating space out wide during build-up play and on the break. If Kuwas has space, he is sure to exploit it. Unlike more classic wingers, Brandley Kuwas has a lot stronger of a physical build. It’s no surprise that the Dutchman was once a left-back before adapting to become a more attacking player. Not only does his physique lead to a stronger presence when bombing down the wing, but it also makes Kuwas a great hold-up option. Often, he will play as somewhat of a wide target-man, boxing out his opponent to receive the ball before passing or turning to dribble. Below, we see the former Excelsior player hold off his defender before performing a nice piece of skill to find his teammate in space. As mentioned before, Kuwas is statistically the best dribbler in Holland. Not only does he complete more dribbles than the likes of Neres, Alireza Jahanbakhsh, and Hakim Ziyech, but he does it in fewer attempts. In terms of open play, it’s his most obvious strength. Three-quarters of the dribbles he attempts are successful, which means that isolating him against a defender is extremely advantageous. For an inverted-winger who plays on his weak side, Kuwas is actually very good at beating his man down the flank. It’s quite strange – a lot of his successful dribbles are done by bursting towards the byline instead of cutting inside. It should come as no surprise that Kuwas is a very quick player, represented by this particular dribble last weekend. As you can see, the defender cheats to the inside as he expects Brandley to cut inside. This allows the winger to catch him off guard and beat him down the byline. Cutting inside itself is not a particularly strong suit for Kuwas, but all it takes is one quick move for enough space to be created for a left-footed cross. Finally, perhaps the scenario that he strives in the most is on the counter when he can run at defenders with speed. Below, we see a situation in which Kuwas skip past a defender and create a big chance for Heracles. It’s important to understand the opposition that Kuwas is coming up against in Holland. Taking these statistical, and even eye-test, results with a pinch of salt is key. Yes, Brandley is coming out on top in duels against teams like Willem II and FC Twente, but how he would fare against Premier League opposition is still in question. Against Feyenoord – one of the better-drilled defensive units in Holland – Kuwas only completed two of his five dribbles. Brandley Kuwas heat map for the 2017/2018 season, all competitions (Wyscout). Pictured above is Brandley Kuwas’ heat map for the 2017/18 season to this point. We can deduce that while the winger clearly starts out wide, he is mobile throughout the 90 minutes. 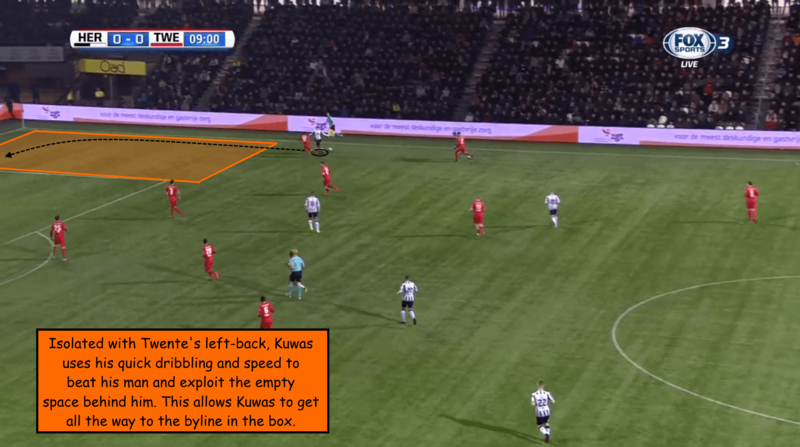 Kuwas often tracks back to help Heracles’ defensive structure, with the winger often taking up a proto-full-back position to defend an opposing winger. The positional play in his defensive half can also represent Kuwas’ willingness to drop deep to receive the ball. 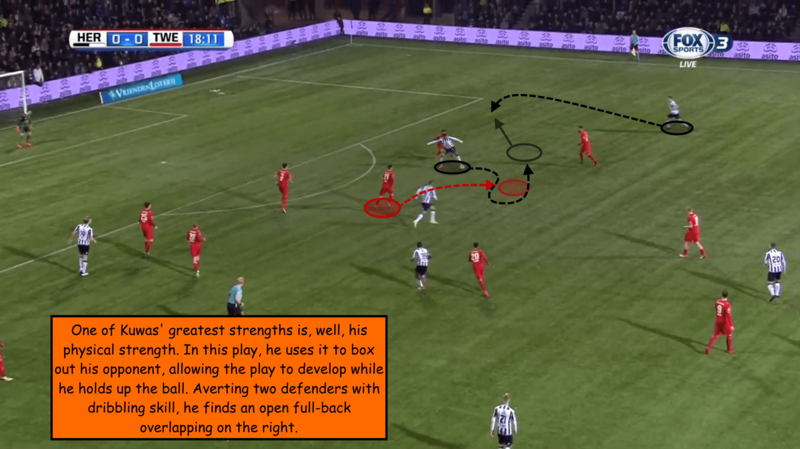 While Brandley is certainly a winger and often takes up the “traditional” winger position hugging the touchline, there are many variations to his attacking positioning. There is a clear history of Kuwas positioning himself in a more central area of the pitch. This is a result of two things: him cutting inside with the ball and him taking up a central position to begin an attack. Often times Brandley can be seen in a sort of false-9 area, dropping deep to receive a pass as seen below. 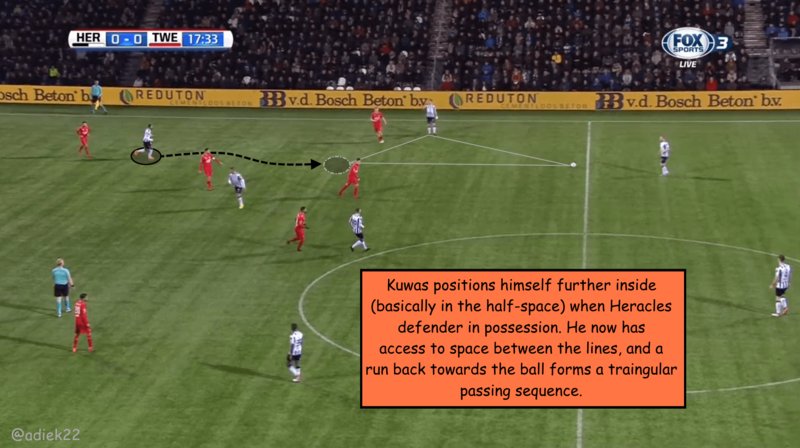 Due to the fluid nature of Eredivisie football, Kuwas sometimes finds himself as far as the left flank during an attack. Not only does this allow him to explore attacking moves against different full-backs throughout the 90 minutes, but it also makes him a more “traditional” winger. In the example below, we see Kuwas make a probing run behind the defence. He whips in a left-footed cross that cuts out multiple defenders and sets up a teammate for an easy finish. Building off the example above, crossing from wide areas is the most common pass type we see from the 25-year-old. In fact, nearly half of Kuwas’ open play key passes come from crosses (per WhoScored). What this means is that, while Kuwas often finds himself in and around the box to complete simple short passes, he’s also very good at whipping in crosses to dangerous areas. It helps that Heracles often play with a tall striker who’s decent at finding space for floated crosses. In the example above, Brandley is the catalyst for a pretty phenomenal goal. Stuck in the corner with a man tightly marking him, the Dutchman of Curaçaoan descent attacked the box on his left side after a quick step-over. Kuwas spots a teammate running unmarked towards the back post and whips in a cross with his left foot. It’s extremely accurate, not only cutting out the defender but possessing enough velocity to make the header unstoppable. It is, however, important to look at Kuwas non-cross passes as well. Due to the nature of his dribbling style, he often gets past his defender and finds space for teammates. Kuwas has completed 77% of his short passes, which is below average in my opinion. Compared to other creative wingers at comparable Eredivisie clubs, Martin Ödegaard (83%) and Younes Namli (79%) have better returns in this category. But is this all down to a below average passing ability or a tendency to pick out more difficult passes? In the picture above, Brandley Kuwas has used his great dribbling skill to open space for himself in Zone 14 – the threatening area above the box. As you can see, two players make overlapping runs on the bottom of the screen. Instead of making a lofted pass to one of these men, Brandley decides to look inside to an open teammate atop the box. This puts a lot more pressure on the defence because there is now a player ready to take a shot at goal from a good angle. If Kuwas had passed to a flank player, it would only be a matter of defending a cross in the box for NAC, the defending team. In this scenario, the pass is successful. NAC Breda aren’t a very structured defensive side, so while this pass worked in this scenario, it may not against better defences. This is the point of this tangent; Kuwas often attempts incisive passes that most wingers wouldn’t. Is he a phenomenal passer with world-class vision? No. Does he bring an added element to an attack in terms of passing creativity? Yes. As a final caveat, the former AZ Alkmaar youth player is quite reliant on his left foot. Much like David Neres for AFC Ajax, Kuwas is reluctant to cross or even make a simple pass on his right, weaker foot. This doesn’t mean that he won’t dribble on his right side; we’ve covered his ability in that aspect. Yet, his passing game is undoubtedly hindered because of this reliance on his left. At 25, it’s unlikely that this aspect of his game will be improved upon much. While defences will definitely use this information to prevent a lot of his attacking force, there’s very little they can do about his quick passes once he gets into space, no matter what foot he’s using. Right off the bat, there’s no doubt that Brandley Kuwas is a long shot taker. In fact, half of his total shots are from outside the box (although set-pieces affect this statistic). There are a few factors that decide why he takes over one-and-a-half long-shots per 90; Heracles often find difficulty in breaking teams down during build-up play, Kuwas is a very powerful shooter, and he’s often found success with these shots. The man is an explosive merchant: explosive dribbling, explosive shots. We’ve mentioned the lower level of defending in Holland, but a seasoned Premier League defender would still struggle with that burst of speed from Kuwas. Often the quickness in Brandley Kuwas’ play style means that he rushes his shots. This is to be expected, but it often leads to quite embarrassing, mis-hit shots that dribble yards wide of the goal. This isn’t something I’m extremely concerned about, but if defenders close him down quicker than we’ve seen in these clips then it could certainly become an issue. Kuwas needs to make sure not to rush his shots too often. If Heracles earn a free-kick from any sort of shooting range, there’s always the chance that Kuwas will smash it in the top corner. He’s not always accurate, aligning with his overall finishing, but his dead-ball technique is up there with the best in the league. Often times you’ll get moments like these if you see Kuwas stepping up to a free-kick. Elsewhere, Brandley’s corner taking abilities are also great. This is somewhat aided by Heracles possessing a couple tall players in the box often times, but Kuwas knows where to place the cross. There’ve been many scoring opportunities created over the last couple Eredivisie matches by the 25-year-old sending in lofted crosses towards an open man at the back post. This, along with his general free-kick taking ability, would translate well to a top European division. Brandley Kuwas is the best Eredivisie player currently at a mid-table club. If it weren’t for the exciting winger, Heracles would be in loads of trouble. With a pension for beating players in one-on-one scenarios and tallying up assists on a weekly basis, it’s easy to see why Leeds United were linked with him in January. At 25, there’s still some improvement to be made in terms of Kuwas’ concentration and overall ability, but he has the ability right now to start for a first division club in England, Germany, or Italy (albeit, probably one near the bottom of the league). Kuwas is a phenom and it’s only a matter of time before he leaves Almelo. With that said, the Dutchman is entering his prime years and still hasn’t played outside of Holland yet. Perhaps the cultural shock may be too big a step for him and moving to a Feyenoord or PSV would better suit him. These are the tough things in terms of gauging a player’s ceiling; personality matters just as much as footballing ability, but I don’t know Brandley personally. Therefore, I can’t say definitively if he would succeed at, say, FC Köln or not. We must also take his surroundings into perspective. Often times the Eredivisie gets a bad reputation for being an extremely easy league for an attacker. Whereas this presumption is not unfounded, it’s also not completely true. The Eredivisie is still a top ten European league in terms of talent and it has produced phenomenal defensive units in recent years. Brandley would find it a lot harder to take on Bundesliga defenders, but it’s not as massive a step as some may believe. Two seasons ago, Brandley Kuwas was unheard of outside of a few footballing circles in the Netherlands. Now, fans who pay attention on social media have surely seen comments about the exciting Dutch winger at a mid-table Eredivisie club. If these fans are looking for the next Dutch superstar to break into European football, they should move along. Kuwas is no superstar. However, if a club is looking for an economical, exciting player with a few seasons of top Dutch football under his belt, Brandley Kuwas could be the player.